When Erik Jensen first trusted in Jesus in 2005, he didn’t know where that journey would take him. Now, he and his wife, Austen, are stepping out on a limb as they prepare to lead a new congregation in Cambridge, Ontario. Erik grew up at Rittman Grace Brethren Church in Ohio (Bud Olszewski, senior pastor). He decided to follow Christ at Momentum Youth Conference (then Brethren National Youth Conference) in 2005 when he says that God rocked his world. Now, as they lead a new congregation at Renew Cambridge, the Jensens’ confidence comes from knowing a faithful God. Their first public service was held on September 16, and their hope continues to soar. “We know that He has called us to this, and He’s opened so many doors and shown His power repeatedly, so we are not afraid,” says Erik. 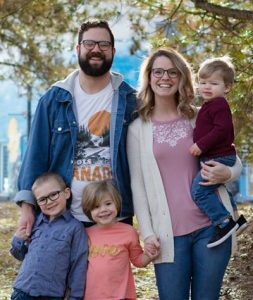 One of the biggest answers to prayer the Jensens have seen is the team God provided for them at Renew, as well as throughout the Charis Fellowship, who shares with them their wealth of knowledge and ministry experience. The mission field in Canada is a difficult one – less than five percent of Canadians claim Jesus as Lord. However, with confidence in the message, Erik is optimistic about the impact Renew Cambridge will have. The Jensens believe that the Gospel will change the world, and that starts with everyday people doing everyday things. [Connect:] To send a note of encouragement to Erik and Austen Jensen and the team at Renew Cambridge, click here.